Rainbow Chard & Figs — Cohabitate Co.
During my last visit to the famers market I was mesmerized by rainbow chard. Grabbing several bunches, I couldn't wait to lay it out, photo it of course, and then eat it! All the colors of the rainbow...except way healthier than than those classic kid cereals that used to grab my attention. Did you know that chard is one of the most nutritious veggies in the world? Seriously. For whatever reason, we never had chard, or even kale, growing up. We would have it occasionally at a restaurant, or randomly at home later on, but my cravings for chard began in Steamboat. My roommate at the time sautéed chard with peach preserves and I thought it was the best thing I had ever had! This recipe is a spin off his. Go grab a bunch of chard and enjoy! Wash and de-stem your chard. You may cut or just pull the leaves from the stem. You can eat the stem, but it tends to be a little tough. Then, dice or mince your garlic and slice your onion. Place your garlic, onion, and olive oil into a saucepan and sauté until onions are cooked (3-4min). 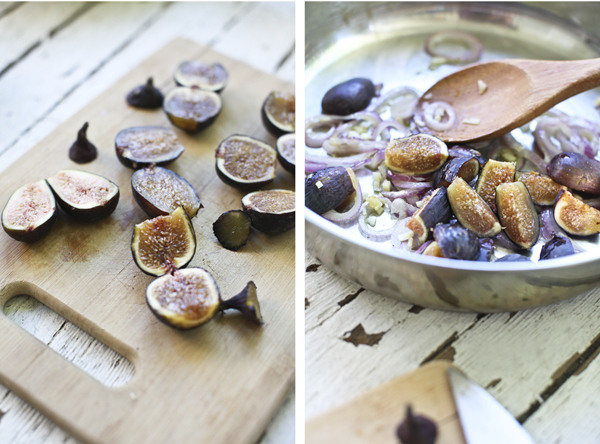 De-stem and cut figs into fourths. Once onions are ready, add figs and chard to saucepan and sauté on low-medium heat for 3-4 minutes. These figs were super ripe and sweet, I didn't even need the honey, but you may add a tablespoon of honey if desired. Enjoy! * Take look at this site for more on the nutritious facts of chard!